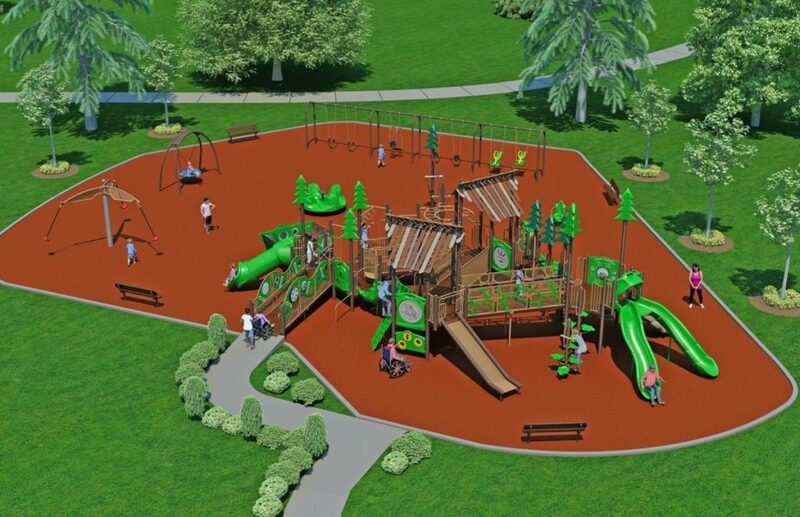 BLOOMINGTON — The city will move forward with constructing Harmony Park — the city’s first playground where children with different abilities can play together — and a new playground at O’Neil Park. By a unanimous vote Tuesday, the council approved the purchase of $330,621 in playground equipment from Charlotte, N.C.-based Game Time/Cunningham Recreation for the two parks. The council’s regular voting session was moved to Tuesday because of the observance of Veterans Day on Monday. The cost includes $266,670 for a special rubberized surface accessible to wheelchairs or mobility devices, inclusive play equipment and swings at Harmony Park, the name of the inclusive play area in Rollingbrook Park in southeast Bloomington. She said there are about 3,000 children with disabilities in the Twin Cities, including her 5-year-old son, Max, who will benefit by having an accessible playground that allows all children of all abilities a place to play safely and independently. The city pledged $85,000 to the Harmony Park project, which was the amount that had been allocated to replace the aging Rollingbrook Park playground with new, standard equipment. Private donations are paying for the cost difference for the specialized playground. A collaborative partnership between four local nonprofit organizations — Max’s Miles Foundation, the Bloomington-Normal Jaycees, Marcfirst and Autism McLean — has been spearheading the Harmony Park fundraising campaign with a $300,000 funding goal. The fund drive also received money through Autism McLean, the Jaycees’ Bruegala and other fundraising events, a State Farm Neighborhood Assist grant, the Illinois Prairie Community Foundation general grants program and the Youth Engaged in Philanthropy program, and the playground equipment company. The group needs to raise an additional $30,000 for fencing and a gate to enclose the play area. Donations can be made online or to Harmony Park’s fiscal sponsor, Illinois Prairie Community Foundation, 915 E. Washington St., Suite 2, Bloomington, IL 61701 and noting Harmony Park Project in the memo line. “This is a tremendous community partnership,” said Ward 2 Alderman David Sage. Meanwhile, Bloomington District 87 is donating $70,000 to pay for new playground equipment at O’Neil Park, which serves some of the city’s lowest-income families. As part of an overall renovation of O’Neil Park, the playground is being moved from the west side to the east side of the park to better serve Sheridan Elementary School. In other action by the council approved contracts related to the $35,000 cost for the zoo’s alligator exhibit. The $35,000 cost includes $15,500 for Stark Excavating Inc. to complete construction of a wall and $19,500 for guardrails, fencing and other materials to complete the exhibit. Funds raised by the Miller Park Zoological Society, a nonprofit organization, are paying for the renovation of the former seal exhibit to house two American alligators that are expected to join the city zoo in April.